If you’ve never seen A Knight’s Tale, the cliff notes version of the story is that Heath Ledger’s character, William Thatcher, pretends to be a knight to compete in various jousting competitions across Europe for fame, fortune, and the love of a woman. Since Thatcher is a peasant, in order to be able to compete, he claims to be a knight called Ulrich von Liechtenstein who hails from Gelderland. While in the film Thatcher comes up with his knightly alter-ego more or less off the cuff, in reality the makers of the movie seem to have given it a lot more thought. You see, while Ulrich von Liechtenstein isn’t well-known today, he is a historic knight and poet who wrote various notable works concerning medieval knights and noblemen, particularly focusing on how knights should behave. From Ulrich’s autobiographical poem, Frauenbuch (“The Service of Ladies”), it would also seem that the Ulrich von Liechtenstein depicted in A Knight’s Tale had a lot in common with his real life namesake. Frauenbuch was written by Ulrich sometime around 1250 AD (about 25 years before his death in 1275). Ulrich is also mentioned in passing in several books about jousting, with it being inferred that he was particularly gifted at the sport, among other knightly endeavours, if not a little flamboyant based on his own descriptions of his exploits. It isn’t clear how much of Frauenbuch is based on actual events and how much was made up for the benefit of the story, which illustrates the knightly ideal of always loving and honouring one’s lady. But as you’ll soon read, it’s fair to say that major elements of the tale were probably fictional. 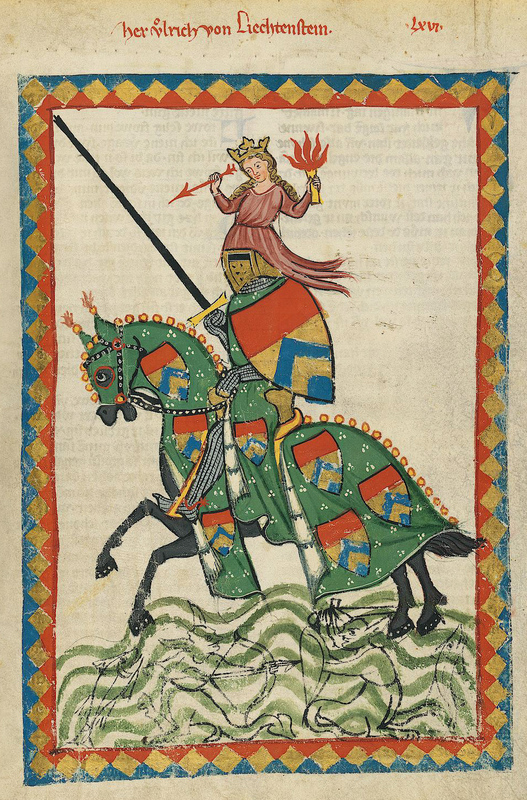 Like his Hollywood counterpart, in Frauenbuch, Ulrich claims much of his jousting exploits were inspired by a woman, in this case, an older, higher ranking noblewoman the young knight became smitten with in his early teen years when he was serving as a page. Although the (married) noblewoman constantly rebuffed young Ulrich’s advances over the years and even openly made fun of his appearance due to his harelip, Ulrich decided to keep trying to win her over anyway. He states that his obsession with this woman was so great that he’d often sneak into her room at night to wash his hands in her bath water, and even occasionally drink it. When Ulrich reached his late teens and found that he had a talent for jousting, among other knightly sports, he began entering tournaments wearing his paramour’s colours, dedicating his many victories to her. When this failed to win over the object of his affections, he subjected himself to dangerous surgery to correct his harelip, which must have made him look a little better because, soon after recovering, flattered that he would do such a thing for her, she invited him to accompany her and others on a horse-ride. However, once he rode up alongside her, he was too nervous to say anything, prompting her to tear out a lock of his hair as a sign of her displeasure over his behaviour. After this disastrous encounter, Ulrich’s crush refused to have anything to do with him and for three whole years, she wouldn’t acknowledge either him or the dozens of poems and songs he wrote for her. She also barred him from wearing her colours in the various tournaments he took part in. A turning point came in Ulrich’s life when, during one of his many jousts, his finger was severely injured and he wrote to his love to tell her of this. She wrote back to Ulrich accusing him of exaggerating the injury. After reading this reply, Ulrich cut off his injured digit and sent it to her. Amazingly this van Gogh-esque stunt worked and Ulrich’s love interest was flattered when she received the severed finger and responded that she would cherish his digit and look on it daily as a reminder of his devotion to her. Back in her good graces, Ulrich was once again granted permission to compete in her name. Keen to win over his love permanently with a major act of bravado and flamboyance, Ulrich embarked on a massive jousting spree from Venice to the borders of Bohemia while dressed as Venus, the goddess of love, dubbing the whole endeavour his “Venusfahrt” (Venus Journey). Over the next five weeks, Ulrich competed in hundreds of jousts against anyone who wished to challenge him, all while dressed like a woman and declaring his undying love for his lady. Needless to say, he states there were more than a few who laughed at him during his exhaustive tour, but he claims he broke 307 lances against his opponents during the joustfest vs. only 271 managing to do the same to him. This Venusfahrt resulted in his lady inviting him to dress like a leper and wait outsider her castle with the other beggars who wished an audience with her. Even still, upon his arrival, rather than greet him, she promptly went to sleep for the night and left Ulrich standing outside in the rain, only sending word the next morning for him to climb up to her window using a rope she dropped down for him. When Ulrich tried to ascend the rope after wading across a moat, she cut it and he fell into the water below. In the end, Ulrich decided to tell his crush that he’d be leaving to go on a crusade for her. This finally did the trick, winning his lady-love’s affections. We can only hope it was all worth it and her higher stationed husband didn’t just have the young upstart killed for having an affair with his wife. Of course, Ulrich also notes in his supposed autobiography that he was actually married himself, and even visited his wife for a time during the saga. When he did so, he found that she was doing a bang-up job of managing his estate and raising his children while he was off gallivanting around doing chivalrous and knightly things like trying to win the heart of a noblewoman (and presumably also having his way with many a wench along the way to celebrate his victories on the pretend battlefield). for serving them, I must confess. What wealth of virtue they possess! my praise of them must be so high. As for the verifiable facts about Ulrich, he seems to have been from a minor, but prosperous noble family, born around 1200 in the Duchy of Styria in the south of modern day Austria. He started out as a page in his early teen years, then he became a squire to Margrave Henry of Istria, the son of Duke Berthold IV of Merania. He ultimately was made a knight by Duke Leopold VI of Austria in his early 20s. We also definitively know that he became a high ranking commander and then a provincial judge later in his life, and that he was the proud owner of three castles at Liechtenstein, Strechau, and Murau, though he gave the castle at Murau to his son, Ulrich II, upon his son’s marriage to Kunigunde of Goldegg. Ulrich was a knight during a time of (relative) peace in the region he lived in during the thirteenth century. This spurred on an awful lot of idle time for knights, who tended to like to fill it by practicing their skills in tournaments that had various competitions, including mock army battles, sometimes with archers and all. In all cases, the weapons were blunted (though deaths did occasionally happen in the tournaments). Given this, it seems very likely that Ulrich did, at the least, attend and compete in a host of tournaments and it seems as if he was relatively skilled at these endeavors. Beyond his martial skills, his various written works strongly indicate he was very well educated and, of course, an uncommonly skilled poet and writer. Were Chastity Belts Really Used in Medieval Times? “…neither particularly famous nor that well known” – What’s the difference? I would have gone for the blacksmith.